Description: Bauer Cornucopia Pin - One of the hardest things to find for the jewelry collector is anything for Thanksgiving (you remember, that holiday that kind of sneaks in between Halloween and Christmas). 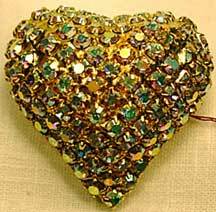 This is done in Madeira topaz rhinestones along with jonquil, hyacinth, olivine, peridot, emerald, siam (red) and even amethyst rhinestones. 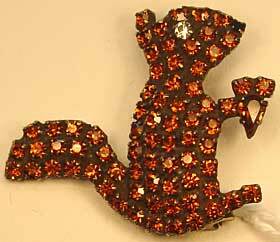 (Entire piece is rhinestones, no genuine stones used.) Set in antiqued brass, this measures about 3" x 1" and is three dimensional. Wear this while you carve the turkey and you'll get compliments not just about the food! 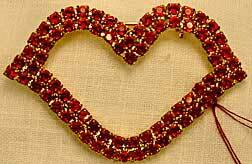 Description: Bauer Heart with Arrow - Huge 3-D heart pin with arrow - this is done in goldtone with light siam (red) rhinestones for the heart and clear rhinestones for the arrow. Heart measures 2" x 1 3/4" x 1/2" deep - arrow is 3 3/4" x over 1/2" at widest points. Description: Bauer Hot Lips Pin - Want to "smack" someone? Done in light siam (red) rhinestones in goldtone - approximately 2" x 1". 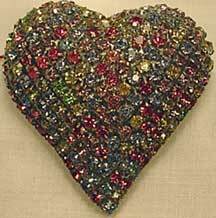 Description: Bauer Large Multi-Pastel Heart - The heart for all-year-round. Done in light sapphire blue, rose pink, lime green, jonquil yellow and lavender glass rhinestones, set in an antiqued silvertone, 2" x 1 3/4" x 1/2" deep. $96.00 Also in stock in blush pink in antiqued silvertone. 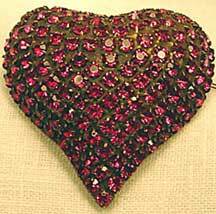 Description: Bauer Medium 3-D Heart in Fuchsia - Who says hearts have to come in conventional colors? 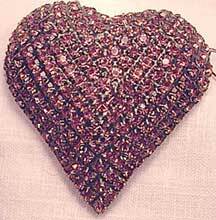 All fuchsia rhinestones, set in antiqued brass. 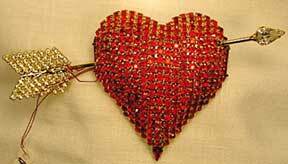 Smaller than the other hearts pictured; 1 3/8" x 1 1/4" x 1/2". Fine on its own or in a grouping. $58.50 Also in stock in crystal aurora borealis in goldtone.